Posted January 12, 2017 by Taneen Carvell & filed under General News. It’s not until I stood in 14 degree weather without my hand warmers that I realized I was due for my annual posting on what not to wear — or more accurately — what TO wear and do when winter blows in like a polar bear! Here are my 10 favorite. Random in order but all tried, tested, and cold weather approved! 2. HAND WARMERS. Buy them in bulk. Now! Be careful on the brands though. I have found the Grabber Hand Warmers to be the most reliable. Key with hand warmers is not to throw them away during the run. Tuck them in a pocket if you don’t need them any more or take your hands out of your gloves and grab the hand warmer still in the glove to get the balance of air and heat. And trust that you will savor them after the run when you are in post run shiver mode! 3. BALACLAVA. Hard to say. Makes me think of baklava. And then makes me think of food not running. But the Balaclava (google it) is great for cold runs as it helps protect your face and yet is thin enough that you can breathe through it and not feel too muffled by it. REI / EMS good shops to find this. I don’t usually wear it fully over my head but use it more as a neck warmer that I can then pull up over my mouth / nose as needed. 4. WARMER SOCKS. Balega makes my favorite blended wool sock but there are other brands out there as well.. I have an allergy to wool so this is a great solution for me. Key here!? They are thicker and may effect how your running shoes fit. You may need to keep the laces a bit looser or even look to invest in the same run shoe a half size bigger to allow you to wear the thicker sock. It will allow the sock to do its job and keep the circulation flowing too which is just as important. A thin tank as a base to keep your core warm. A long sleeve tech shirt and a lined wind breaker. OR a warmer fleece lined half zip with a vest. Test each and see what you favor. Over layer first and learn to trust what you need from there. a) Ears! Hat or head band. If its really cold, I go for the hat. But really prefer the headband so my head can breathe but my ears are warm! b) Hands! Gloves are good but if its windy — gloves that also have a mitten component over them to help further shield the wind — better! Hand warmers as noted above but also remember. Skin to skin is warmest. I take my fingers out of the glove digits and make a fist around the hand warmer or just as a fist if its a bit too warm for a hand warmer. The glove still protects my hand overall but my fingers fisted together keep each other warmer. 7. SHORT AND SHED TRICK! I’m going to patent this I swear…. I hate to be cold. I hate that I know I’ll be cold the first mile and will be burning up the next 10 miles if I dress to be warm the first mile. SO! Go out layered up and add that one thick extra layer that is going to get you out the door. Run the OPPOSITE direction of your planned run and run for about 7 to 10 minutes. Then turn around and head back to home (or your car). Shed that added layer you knew you wouldn’t want one minute more… and continue on in the planned route direction. And bonus!!? You have that added layer waiting for you when you are done! Woohoo! Just as it is in the extreme heat, less time in the drastic cold is equal to a longer run in milder temperatures. Why? Because your body is working a lot harder to stay warm. Your breathing will be a bit challenges as well which means you need to temper your pacing and respect the conditions equally. But I promise… getting out in the elements at least 2 times a week will really help your body learn to adapt and will make you all the stronger for it! Get out or yes. Get on the treadmill. Give yourself 20 minutes. If you are miserable, cold, or out of your mind, you can stop. But likely at that point you’ll be able to get to 30 minutes. And well then that is close to 40. From there you are in the victory zone so smile because something turned into far more than nothing! Well for me its hot coffee. But that hot treat makes it all worthwhile! Embrace the elements. Makes you more ready for whatever race day brings. And yea, it makes you look pretty bad arse out there too! Posted March 7, 2014 by James Pederson & filed under General News. Anyone coached by me knows I’m full of random bits of running and triathlon information. For all the years, experience, training, racing, and coaching I’ve done – there aren’t many topics I haven’t addressed. So when I was asked to speak to two popular running topics – I was more than willing! But wait… live? On the radio?!! Oh hey. This is a new one for me. I love to entertain a crowd of eager runners at o’ dark 6am in the morning or help an athlete conquer a training set back with wit and wisdom. But to speak out to the masses without seeing their faces and reactions? To talk slowly and deliberately so it translates effectively in this medium of audio translation? Did I not mention I don’t like talking on the phone for just this reason? But to get the chance to help those out of reach from my local perch with questions that so many ponder – I decided it was worth the venture. Besides, I got to share in the experience with two amazing women, Michelle King Robson and Dr. Pam Peeke (who just happens to be one of my athletes! )– on HER Radio on RadioMD.com. Below are links to the podcasts in part to the topics covered in two separate interviews: The Best Pre/Post Workout Meals and How Different Running Surfaces Affect Your Body. I can’t say I’ve listened to them myself — who likes to hear themselves talk right? But rumor has it they provide the Coach T tips and insights worth the ten minute listen. I mean who doesn’t want to learn what ‘orange comfy joy’ a track surface can be! My thanks to Michelle, Dr. Pam Peeke, and the wonderful community of EmpowHER.com / RadioMD for the fun this new media format proved to be and the chance to bring my insight and information out to those I couldn’t reach otherwise. Posted February 28, 2014 by James Pederson & filed under General News. As the CT3 website launches the next phase of adventures for me and all the athletes I get the honor of working with — I can’t help but reflect on what an amazing four years its been getting here. Anyone that has ventured into the world of running and triathlon – or any such life adventure beyond the norm – gets called crazy from time to time. When, in my 30s, I charged through injury after injury determined to run marathons and reach the holy grail of that distance – the Boston Marathon — people said I was crazy. I did it anyway. And succeeded. So you’re done with this now, right? Oh. No. In fact, that victory only encouraged me to test fate even further by adding swimming and biking to the mix as I set on in the world of triathlons in quest of the next holy grail -Ironman World Championships. Ha, well okay — that will take a bit longer to achieve – but I did celebrate my 40th birthday with my first Ironman and marked it with a tattoo I will never regret no matter how old I am. In those 8 years, I met a lot of amazing athletes, friends, doctors, coaches, and the like. All of them as crazy as I and encouraging to the quest no matter how crazy it seemed. Those people are the foundation for what I do now because they didn’t give up on me. And it taught me so much what the value of such support means in quest to any dream or athletic quest you may have. As I continued my athletic endeavors and conquered more marathons and Ironman races, my life as a marketing and design consultant had its own wave of successes and set backs. I was making it work but the effort seemed far greater than the reward more often than I could say. But like anything else, I kept at it as it was as I knew to do. As my good friend Joey will tell you. I was about at my limit and shared such sentiment with him as we trotted through a cold winter track workout in the winter of 2010. Then, just a month later. My mood and my sense of hope changed. He tells it better than I but the gist is this. 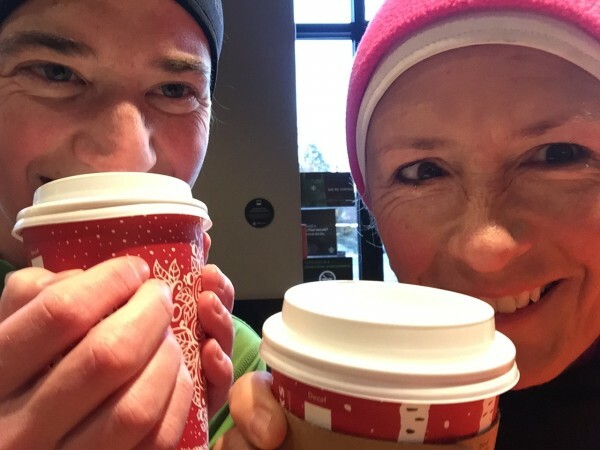 In that month, Cathy Pugsley, shared owner of PRR and one of my track coaches in pairing to Margie Shapiro who was my gold star coach of Ironman triathlon through my three completed 140.6 races at that point, asked me to teach a 101 running class in their DC store location starting in early March. Hmm, well. Okay. Sure. Not really a coach but I know a lot about running. And was indeed a beginner – and return beginner after many injury set backs. Well, why not. There were six people in the class. 4 of which really came to be the heart of the class as the other two had been sidelined before they even got started. Michelle, Cindy, Megan, and Michelle. I could write on an on about that 8 week class and the amazing women that stood with me through it all and the difficult life experiences we shared together as timing would have it and the bond that was created as is so often with those you run and train with. I could. But I will just thank them now instead. As I thank Cathy just about every day as well. Because it was that class that taught me that being a coach is about knowing and loving your craft to its core. And about compassion, communication, trust, challenges, pushing beyond them, knowing when to give in to them, and being as authentic to your role as coach as you are to those you work with – and so much more. Its what started it all. And what brought light to my face when Joey and I next plodded around the track. And is what brought me to this place — and my new space. From that first day and that first class, I began visioning what I could do in offering as a coach. And how I could pay back all those that shared my passion for crazy early on by paying it forward and giving others that sense of belief that crazy is a bold and powerful and fabulous thing.